With spring blooming, one can almost taste tomatoes, corn and other treats from local farms. Luckily, a new crop of farmers is growing to fill our plates with goodness. The Ashland-Talent Grower’s Collaborative unites three farms, with other producers, to provide fresh, sustainable foods. The farms, Village Farm, HappyDirt Veggie Patch and Meadowlark Family Farm, grow more than 50 varieties of produce They’re offering a Community Supported Agriculture (CSA) Program, and ‘Farm Bucks’ to purchase individual items. I interviewed the farmers to dig up the details. What brought your group of farmers together? Chris Hardy (CH): We wanted to see if we could make small-scale agriculture more viable and resource-efficient through collaboration—sharing marketing, equipment, planning, labor and purchasing. The current economic reality is inequitable for farmers. Together, we can achieve more with less, and serve customers better by providing more diverse items. What are your farming methods and philosophy? How does this benefit us? Matt Suhr (MS): Our methods start and end with the soil. Maintaining its integrity is key to a healthy bioregion and soil food web. Though none of us own the land we farm on, we steward it as if it were going to be growing food for future generations. We use organic and permaculture techniques, are adapting plant varieties to our bioregion and are saving seeds, ensuring long-term food security and a healthier planet. Our goal is to sell what we grow locally, keeping dollars in our economy and providing local fresh food that’s more healthful and alive, and tastes incredible. What’s the scoop on your CSA program? Quinn Barker (QB): The CSA lasts 20 weeks, with boxes available every Friday from June 4th to October 15th. 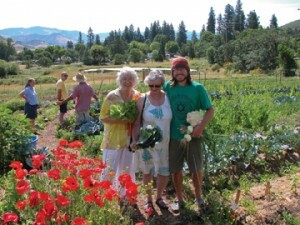 We offer two CSA box sizes: Family share for $560 (3-4 people) and Single share at $360 (1-2 people). There are two pickup points in Ashland, with more to be added. We also offer delivery for an additional $5 per week. What can a CSA subscriber expect to savor? What if I’ve never heard of the veggies I get? Michael DiGiorgio (MD): CSA members will receive a delicious bounty, changing as the seasons evolve. This includes many varieties of beets, carrots, lettuce, eggplant, spinach, tomatoes, onions, beans, peas, squash, garlic, peppers and herbs. We’ll also offer farm updates and recipes on our website to help members enjoy their produce fully. How do ‘Farm bucks’ work? Matt Suhr (MS): Farm Bucks are pre-paid vouchers that can be spent with our Collaborative’s farmers, at our farms or our stands at the Ashland Growers Markets. They’re available in increments of $50, with a discount of 10% through April, and 5% thereafter. How will partnerships with other farms and producers expand your offerings? Chris Hardy (CH): We’re working with additional farms and value-added producers to offer fruit, eggs, mushrooms, bread, dairy, sauces, pickled foods and more great local products. Why is it important to support local farms? Chris Hardy (CH): Our community’s health depends upon this. With less than 3% of our food supply grown in the Rogue Valley, unprecedented global political and economic challenges facing us, and food safety issues increasing through consolidated, industrial agriculture, it’s time we bring it back HOME, to the farm. Quinn Barker (QB): We also need land stewardship that considers the development and conservation of soil fertility to be of the highest good, recognizing this priceless resource. What are the challenges you face as young farmers in the Rogue Valley? Matt Suhr (MS): Our biggest need is affordable farmland, especially land that will be maintained for agricultural use. As long as land is seen as a commodity it’s never safe from development for short-term gain. We may get offers from land owners to farm on their properties, but who don’t share our vision. Ideally, a land owner would make a long-term commitment to keep land in sustainable agriculture use for 100 years or more. Ron Roth at Eagle Mill Farm did this by putting his farm into a Conservation Easement, a great example. Michael DiGiorgio (MD): Working capital is also a challenge and that’s why we do CSA’s. When people buy CSA shares, they reserve a share of the harvest and provide working capital to buy compost, seeds and equipment. So, please support your farmers and buy into CSAs! Can people volunteer? Are you planning events? Sascha Meier: We’ve also teamed up with Farm to Fork Events, which seeks to provide unique culinary experiences and reconnect people to the source of their food. We’ll be hosting benefit dinners on local farms, featuring freshly harvested foods prepared by local chefs, with proceeds supporting our collective and other area food organizations. How can people get information and sign up for your CSA and Farm Bucks? Visit our websites: www.happydirtveggiepatch.wordpress.com, http://meadowlarkfamilyfarm.blogspot.com; email us at farmerscircle@gmail.com or call 541-531-7467. See you at the farm!